Rachel asked Jesus to come into her heart on June 17th, 2009. In July, she attended our church's "I'm A Christian Now" class that helped her understand more about her decision, our church and explained what the Lord's Supper is all about. 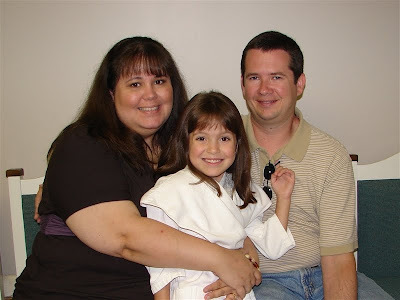 After she completed the class, we were able to schedule her baptism. 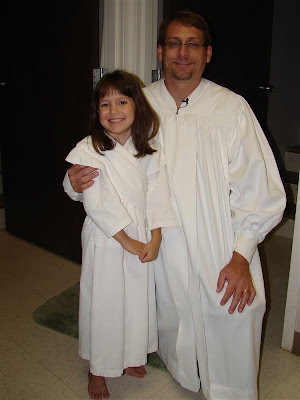 This past Sunday, August 16th, Rachel followed our Lord's commands and was baptized at our church by our Children's Pastor, Ron Pierce. We could not be more proud of Rachel and her decision to follow Christ. 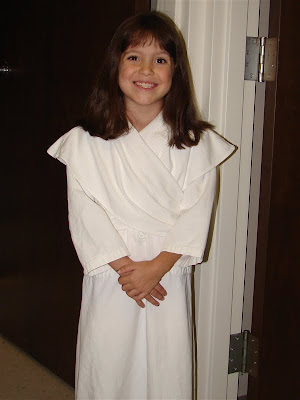 Seeing her be baptized was a moment we will never forget. Something neat that our church does is to videotape your testimony. You could kind of hear it on the above video of her baptism. They show this video right before the baptism takes place. It is a public way of sharing with our church family your personal testimony. Being a performer, Rachel could not wait to have her testimony recorded. She thought it was neat to watch herself on the two big TV's in our sanctuary. Here is the video below so you can see what everyone else did. That is a precious video of her testimony. What a GREAT idea!! Now if every church had the man power to do that. :) Thanks for sharing. So sweet.